PHOTOGRILL: Why did you make the “Dust” photograph? PHOTOGRAPHER: For the “Dust” shot – that was one of many test photo shoots that I coordinated at my former Los Angeles studio. A great way to test new talent as well as build portfolios was to conduct test shoots weekly. For this specific shoot, I was mainly inspired by the custom wardrobe by Marco Morante (Marco Marco Couture and House of Infinite Radness). The whole crew were: Wardrobe Designer / Stylist: Marco Morante, MUA: Ashleigh Louer, Hair Stylist: Christopher Sato, Assistant: Paul Wallace, and Model: Samantha Robertson. Samantha was straight from Australia, 16 / 17, really optimistic and a good sport. Reminded me of a classic 90s woman during the age of supermodels. PHOTOGRILL: Where did the idea come from to create a room-full of dust, settling on the model? PHOTOGRAPHER: The shot itself was a fluke but also easy to achieve. 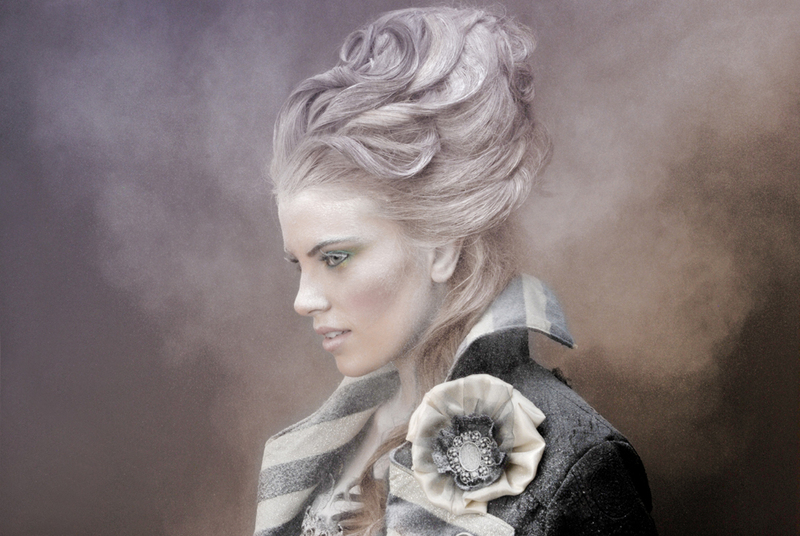 After we had taken the shots for the story, we thought to play around, add powder to the hair and see how it works out. Just by having her walk into the studio, a dust cloud followed her. After a few moments to settle, I started shooting. She sneezed, which kicked up a big plume, which surprisingly worked well. We had her re-create by swooshing her head then stopping still, and within about 10 shots we had this shot. To see what else could be done, we tried to control the situation more, like having Christopher bop her on the hair with a mailing tube. Fortunately, the most organic method is what worked the best. After this shoot, I tried to find coloured dust (like Holi), but I couldn’t manage to find anything that wasn’t toxic! PHOTOGRILL: What post-production is involved? PHOTOGRAPHER: I usually retouch my own work because I know exactly what I need to have taken care of. I have found there are a great deal of heavy-handed technicians out there. For this photograph there were really minor changes to be made. Her skin was flawless – but the dust is what makes the shot, and there wasn’t much need to amend it. There is slight coloration to the cloud. That’s the only major change from the original. PHOTOGRILL: How is working on a test photo shoot different to working directly for a client? PHOTOGRAPHER: Working on my own projects or for clients, it doesn’t differ much. For the most part, when a client hires you they know your body of work and come with an expectation for a product that is in that lieu. Most clients also don’t know what they want until they see it, so I come prepared with reference images of how I would interpret the objective. For the most part, I’ve been able to retain a good amount of control when it comes to both scenarios. With my personal work, everyone is working pro-bono, so I allow for more input from hair/make-up than normally; but I trust the people I work with so our ideas typically already meshing. I determine the story, hire the crew, cast the models. Building a portfolio is great, out of the sheer enjoyment of collaborating to create beautiful photography. I love working with new people, finding their strengths and experimenting with new challenges. PHOTOGRILL: What equipment was used? PHOTOGRAPHER: Canon 5D Mark II, Canon 24-105mm, ISO 125, F20, handheld. PHOTOGRAPHER: I got my start in photography by doing travel and still life then expanded to fashion which led to product. Being somewhat realistic, I didn’t think that I could seriously consider photography as a career because the market is so competitive — especially as new media keeps expanding. It really all comes down to self-drive because no one will find work for you; you have to stay very pro-active. I’m self-taught when it comes to studio lighting and DSLRs; I have never assisted. For my undergraduate degree, I went to NYU for film which is all hot-lights, so it was a tricky transition to strobes; I would rent a kit from Adorama up at Union Square to play with it over a weekend, forcing my mates into silly costumes with props. At 22, I was selected as the youngest of six “contemporary fashion photographers,” for a four-month show at the Museum of Fashion in London. 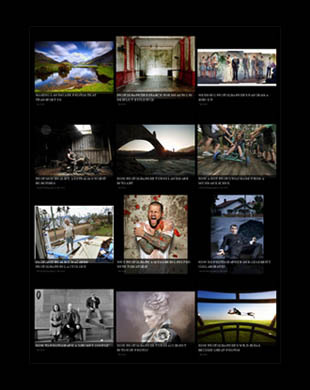 This year I was also commended for fashion at the 2011 Sony World Photography Awards. My clients have ranged from beauty magazines to celebrities, most notably the cast of NCIS for TV Guide Magazine. The style I aim for is blending timeless Sixties sensibilities with an infusion of a fresh, current edge -— which evokes nostalgia while retaining a modern, innovative context. The cat-eye, for example, is a mark of classic elegance but still remains dated, so I try to pull that connotation and twist it to a future conversation. PHOTOGRILL: You also do product photography? PHOTOGRAPHER: While in LA I was the Photography and Imaging Director for a beauty publishing company, so I was working with product and make-up shots daily. It was great training in sorting out the science behind product photography. Once you figure out the combinations of light, you can cover any product you come across. I prefer working with models, but product isn’t so bad (as long as you have a great art director). This entry was posted on Friday, June 3rd, 2011 at 8:01 am. It is filed under The Grill and tagged with Creative Photography, Lighting, People, Portraiture, Studio. You can follow any responses to this entry through the RSS 2.0 feed.